It has taken quite a while to read "Beyond the Rainbow". The main text of the book runs to 620 pages! Given the amount packed into those pages, this represents good value for money for a book which will set you back about $30. The book is a cross between a spiritual self-help book and a junior college text. On the one hand it can be deeply personal, exploring large vistas of the author's philosophy; on the other it can be academic and analytical. It will appeal to intellectual folk wishing to explore various realms beyond the mainstream paradigm. The book is very well written, and there has evidently been a massive amount of research undertaken to build it into the substantial volume that it is. Judy Kennedy presents many précis accounts of various contemporary books from the field of alternative science. She analyses their content as she goes along, and invariably extracts conclusions that support her general thesis. This approach runs throughout the book, giving the feeling that "Beyond the Rainbow" is a conglomeration of ideas drawn together from a veritable library of source material. This makes it an excellent introductory book to the field, because the reader of "Beyond the Rainbow" will be able to dip into a great many fields of study, then use the substantial referencing on offer to research further. Rather like a compilation CD of a particular genre of music leads you to new bands. If I had to edit the book, I would change the format, though. I would shorten the 7 main essays in the book, cutting back on the quotations from other books substantially. The linear approach taken be the author, roving in turn from one source text to another, needs breaking up. The substantial space that would be saved could then be devoted to much needed illustrations, of which there are presently exactly none. However, the clear need for serious pruning does not mean that this is not a book worthy of a devoted readership. Judy Kennedy is an eloquent author, and reflects on her source material intelligently. Her conclusions are more often than not spot on, reflecting a subtlety of understanding often lacking in the field. It is true that she can be a little "one-eyed" at times; the text would benefit from more scepticism. But beyond that she tackles the many subjects covered by her book with a tenacious spirit. The book explores many esoteric teachings, including religious and mystical philosophies. Then it looks at the connection between these ideas and the more modern phenomenology associated with UFOs and alien contact. We have much to learn from our ET cousins, it seems; a spiritual journey which is currently blocked by the materialistic drive in our society, aided and abetted by the mysterious 'muddlers'. To overcome this, a shift in understanding is required. This line of thought takes a distinctly New Age slant, and Judy Kennedy presents much source material to lend the thesis credibility. She recommends each of us embark on a journey of spiritual awareness to release the Dragon within ourselves; that only a mass shift of consciousness can allow our race as a whole to achieve enlightenment. This is certainly a worthy quest, and readers of her book who brave the 600+ pages may well be tempted to look for such answers within themselves. 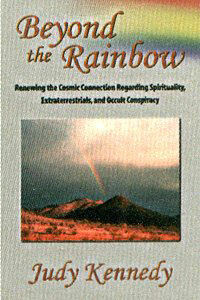 Subtitled "Renewing the Cosmic Connection Regarding Spirituality, Extraterrestrials and Occult Conspiracy"